Of course, we all have a general idea of what blooms or changes colors….but some of these events have a 1-2 week window of opportunity. And let me preface this whole list by saying this once…..weather in Buffalo is crazy. We all know this. We can have 70 degree day in February and a snowstorm at the end of April. Each year is different and unpredictable and that will affect when each of these events take place. But, at least here is a general idea for you as to when to plan your session around blooming and colorful foliage. What better way to kick off the colorful spring after a long, cold, dreary Buffalo winter, than with tulips!! Now, I used tulips for my own wedding which was on May 1st. That year was a very warm spring and we were worried if the tulips were even going to make it until May 1st. The day came and they were in fact were on the downswing and it was a sunny and mid-70 degree day. There have been years since when it’s 30 and not a single leaf on the tree on May 1st. My first year of these mom sessions in the tulips were the first and second weekend of May and were about peak bloom the first week and on the downswing by week two. Last year we had a snowstorm on April 29th and they were so delayed. So, as with everything, you never can pinpoint exactly when they will look their best, but I’d say beginning of May is when I typically plan on tulips. This sweet photo from this mom & child session was of an apple tree and taken on May 17th. I generally plan on apple trees being bloomed and beautiful around the middle of the month of May. This photo below was taken on May 30th and as you can see, the flowers are almost all off the tree. However, check out this beautiful tree that we used during this same session and how absolutely full and colorful it is! I know the Cherry Blossom Festival at the Buffalo History Museum takes place the first weekend in May, but I also believe it was freezing cold and things weren’t bloomed last year that weekend. If you’re able to be flexible with the date of your photo session and really want beautiful blooming trees in your photos, then plan on the middle of May, but monitor the weather and their growth and adjust if needed. Another highly requested scene for photo sessions is a field of wildflowers. July and August are typically when I schedule the photos you will see here. This image below of mom & her baby was taken in August, and these little purple beauties usually pop up in this field for just about 1-2 weeks before they get brown and crispy from the dry & hot August weather. Check out the beautiful flowers below that grow over the WNY summer. Man do you guys love sunflowers!! Another highly requested look is a field of glowing, happy, sunflowers! Again, my sunflower sessions typically occur in at Wild Blossom Hollow and we typically plan on scheduling these the end of August and into September. Listen, we live in Buffalo, NY….I know many of you (myself included) grumble over the cold January & February, but I really feel fortunate that we live in an area where we get to experience the four seasons and all the beauty it provides. And the absolutely glowing, vibrant, warm colors of the WNY autumn is one of the most stunning backdrops you could ask for for a photo session. I typically plan on leaves being there most vibrant around the second week in October and lasting for a couple of weeks. You might be shocked to know that this photo above of the little girl reaching for the leaves was taken November 12th! But, it was about the last tree in the woods to have leaves on it….and on the positive side, the fact that all of the surrounding trees had already lost their leaves it literally scattered the whole entire ground in color. But, I don’t suggest waiting that long for your fall leaf family photo session. Aim for mid October and just watch the weather as I mentioned before. 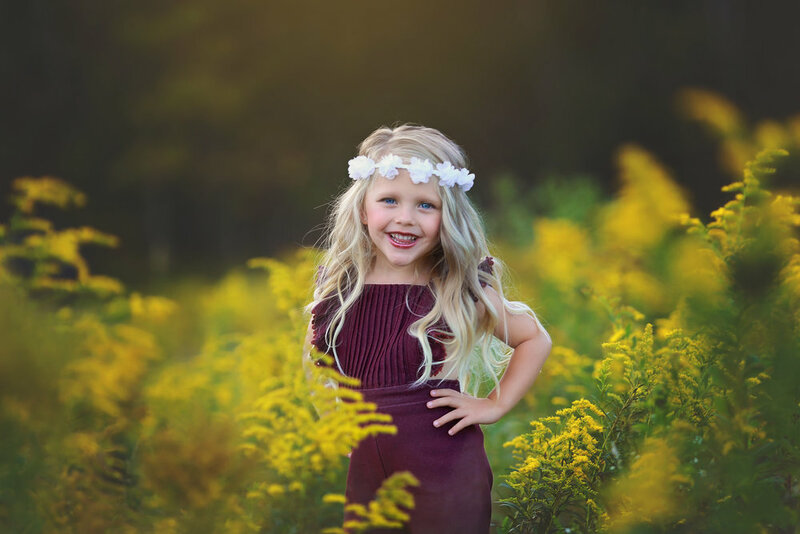 So, if you’re looking to plan a photo session and are interested in using one of these beautiful backdrops provided by Mother Nature, then I hope this little blog will be of some assistance to you.